This is an adaptation of the Agatha Christie play written for the screen and directed by Billy Wilder. The story is a murder trial in London at the close of the Second World War. 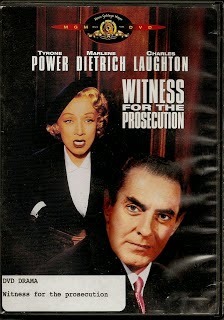 Tyrone Power plays an innocent man accused of a capital crime. He meets and befriends an elderly widow who turns up dead one week after having named him heir to her estate. The only person who can provide him with an alibi is his wife, Marlene Dietrich, who plays her character with an icy coldness. She claims that her marriage to Leonard Vole (Power) was a sham and this allows her testimony to be used against her husband, much to his detriment. Billy Wilder drew remarkable performances from both Tyrone Power and Marlene Dietrich. Charles Laughton and Elsa Lanchester are superb in their respective roles and the whole production is flawless. Ultimately setting her husband free with false testimony and a surprise witness, the ending is explosive as the full realization of what has transpired is laid bare before your eyes. In a climactic scene worthy of Alfred Hitchcock, Billy Wilder pulls off an ending in which the schemers become their own victims. With one of the best courtroom scenes ever filmed, this is a movie not to be missed.